Yummy , and psss - Healthy! - OMG Parenting!OMG Parenting! ← Are My Child’s Tantrums Normal? Desserts are especially fun for our children. Well, let’s face it, for us too! No matter what you are cooking up, desserts are always a good addition. But how do you keep it yummy yet not sugar crazy? How to Make Sugar-Free Fun! “I love to bake and I love to see my son enjoy my baked goods. There is something primal about seeing the people you love feel loved and nurtured by food. I also admit, seeing them smile with the expectation that it will be sweet can be a bit of a double-edged sword. On the one hand, it is fun to see them get excited about sweets, on the other hand knowing that the sweet treats are not exactly nutritious certainly makes every mother pause (or cringe at times!). Decrease the Sugar in Recipes: Decrease the sugar by 1/3 in a given recipe. This works well for sugar and gingerbread cookies. Flour may also need to be decreased a slight amount to make up for the loss of the sugar. Hold out a few tablespoons towards the end of mixing to determine if they will be easy to roll out. 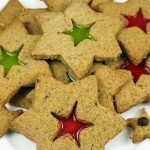 If you have had an issue with a specific cookie recipe spreading too much, sugar or gingerbread cookies would be the best recipe to try with this technique. Tip: Spreading in cookies is due to having a large amount of sugar in the recipe. There are also a few new sweeteners on the market that utilize stevia blended with sugar – these can also help to decrease sugar content! Use Sugar-Free Candies and Chocolate Chips to Decorate: There are sugar-free gummy bears, jelly beans and other sugar-free candies for decorating cookies instead of sprinkling them with sugar. Amazon has a full selection of sugar-free candies. Sometimes the diabetic section of the grocery store or pharmacy may as well. Even just a few sugar-free chocolate chips (Lily’s™ stevia and erythritol sweetened chips are good to use) when decorating gingerbread men gives them a wonderful added flavor and can add a fun pattern when melted. Embrace Traditions in a New Way: The great thing about children is that unlike adults they don’t always recognize the variances in sweeteners. Making a transition for young ones from sugar-full to sugar-free (or decreased sugar) is not as big a stretch for them as it is for most adults who have had years of training their taste buds! When I bake sugar-free I always offer it to my son. I do not tell him it is different in any way and I allow him to decide whether he likes it. Nine times out of ten he does and the wonderful part is that he does not crave more, not because it isn’t good but simply because it is satisfying and does not create the addictive behavior that sugar does. 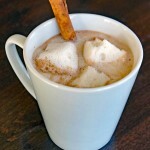 Cookies and hot cocoa are among kids’ favorites at any time of year. Try my recipe for Sugar-Free Window Cookies . In this recipe, I show you how to use these candies in cookies! Thanks, Jennifer! Loving these tips! Happy dessert cooking everyone. Take care now, Natasha. Enjoy your sweet tooth without worrying about its health. Jennifer Knollenberg is a nutritionist and recipe developer for one of the leading nutritional companies in the world. She is a pastry chef, mother of three adult girls and a five-year-old boy in Boulder, Colorado. Jennifer began her sugar-free journey over 20 years ago but had trouble finding a sugar-free alternative that was healthy until recently. She tells us, “What really helped me to transition to a truly sugar-free lifestyle is understanding what sweeteners work well together and do not have an impact on my health or blood sugar. Then it was simply a matter of creating recipes that work!” Want more fun and yummy dessert recipe tips? 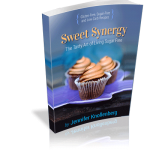 Check out her book Sweet Synergy!